Gibson, Ritter - with success at World Cup! Juventus members, Stefan Ritter and Kinley Gibson, are currently training with Canada's national team program. Stefan is training with the sprinters, and Kinley until recently with the NextGen program. 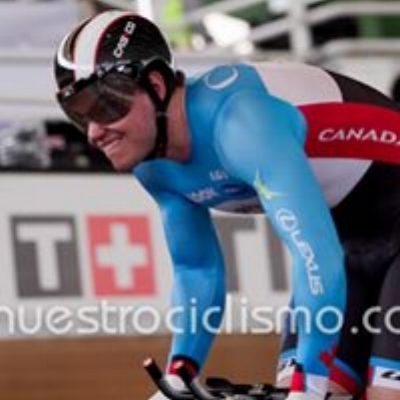 This past weekend, they raced in Cali, Colombia at the 3rd UCI Track World Cup. For Stefan, this was his first experience racing against elite men at the World Cup's international level. For Kinley, this was her first experience racing as a member of the Canadian elite women's pursuit team. Stefan got his first taste of competition on Day 1, racing the last leg of the men's Team Sprint. The key for Stefan was to get onto man 2's wheel (Canadian rider Hugo Barrette). In man 3 position, Stefan had 500 m of hard effort and then a final 250 m of intense, try and hold on till the finish effort. The Canadian team (Patrice Saint-Louis-Pivin, Hugo Barrette, and Stefan), finished in 9th, just 0.2 seconds from qualifying top 8 for the final. Stefan Ritter with a good start for the Team Sprint qualifier. Day 2 - Kinley would be in P1 (starter) position for the women's team pursuit qualifier. The team of Kinley, Laura Brown, Ariane Bonhomme, and Steph Roorda started well, and was a half lap in, when the marshall double fired his gun: a rider on the opposition Polish team had pulled out of her pedal. A successful re-start allowed the Canadians to ride, and qualify in 2nd place into Round 1. Kinley Gibson launches for the team pursuit qualifier. Day 3 - The final day of competition was successful for both Stefan and Kinley. The Canadian team pursuit women rode against the Aussies for the right to the gold medal final: although the Canadians improved their time by over a second (and had the overall second best time in the competition), they were bested - and qualified for the bronze medal final against France. Stefan competed in his specialty, the 1 km TT (kilo). Stefan is the current Junior World Champion and Junior World Record holder, but this was his first time experiencing both a qualifier and final in the event - and at the international elite level. Stefan, with a very good effort, qualified in 7th place for the final. Canadian women qualify to race in the bronze medal final. Stefan Ritter qualifies for the 1 km TT final. The final session on Day 3 provided the toughest weather conditions of the competition. Although covered, the track is open air; the tropical 32C atmosphere is kind to muscles, but wind gusts wreak havoc with effort and lines. Still, everyone is on the same track. Stefan starting the kilo in Cali, Colombia. Stefan ended up in eighth place in the 1 km TT final. "My first goal was to get into the top 8 for the final, and I did. In the final, I wasn't as good as I expected or wanted, but I can't really complain about a top 8 at my first World Cup." In the TP bronze medal final, the Canadian women put together their best performance of the event. Canadian women after winning the bronze medal final - 2017 World Cup - Cali, Colombia. Congratulations to Stefan and Kinley - great representatives for Canada, and Juventus Cycling Club! Stefan Ritter and Kinley Gibson - 2017 Track World Cup - Cali, Colombia. Posted on February 20, 2017 by @Juventus Cycling .